Hi, Wendy! We're delighted to have you join us today. Congratulations on the release of your debut book, Lady Vice, the first book in your Furies series. Please give us an overview of the series. Thank you for having me at the Romance Dish! The Furies series follows three female friends—Lavinia, Lady Vaile; Lady Sophia and Thea, Duchess of Wynchester—who have banded together to survive in late Georgian London. Sophia is a widow and Lavinia and Thea have done the unthinkable and left their marriages. The series begins with the murder of Lavinia’s husband. Though that crime is solved by the end of Lady Vice, details are uncovered that spur the other two furies into crisis. The books are stand-alone romances, but they are intimately connected and all three ladies play significant roles in each other’s stories. That sounds delicious! What can readers expect from the first book, Lady Vice? Lady Vice is a second-chance reunion romance set against a high-stakes murder investigation. It’s a story of a woman rediscovering optimism, confidence and love. Though Lady Vice is in some ways the darkest of the three books in the series, I hope I made the heroine’s journey vivid, emotional and cathartic for readers. Note from PJ: I started reading Lady Vice Saturday evening and didn't put my Kindle down until I turned the final page...whereupon I realized that not only was it well past my bedtime but I had totally forgotten to eat dinner! It was vivid, emotional and, overall, a wonderful read. Now I'm excitedly awaiting book #2! What would you like readers to understand about Maximilian and Lavinia? Lavinia is struggling to recover from the effects of her late husband’s depraved behavior as she faces accusations of murder. Maximilian Harrison is a warm, steadfast, honorable hero who has faced his share of dark battles since he last set eyes on Lavinia. He is just the man to champion Lavinia and help her heal, although to do so he has to let go of some cherished aspirations. Would you like to share a short excerpt from the book? Max fell against his chamber door with a silent, shuddering sigh. Tucked into the shell of his bed, and gleaming like a rare pearl, rested the object of his lifelong fascination. His golden bed covering cast a warm glow on her cheek and her light brown hair—finally the natural, unpowdered color he remembered—spread over his pillow in waves of inviting silk. She lay still, protected by sleep’s gentle arms. He placed his hand on his valet’s shoulder in a thankful pat. His valet bowed before discreetly disappearing. What do you enjoy reading when you're not busy creating your own stories? About half the books I’ve listed on Goodreads are shelved in Historical romance, my first love. I also enjoy cozy mysteries, biographies, non-fiction and memoirs-of-discovery like Wild and Eat, Pray, Love. In what ways have you been surprised during your journey to publication? I’m in awe on a daily basis, to be honest. But the greatest gift has been the friends I’ve made in the romance writing community. I’ve found ‘home’ and I never expected a competitive industry to be so warm, welcoming and encouraging. Romance writers not only write about hope and love—they live it. You're quite the world traveler. What's your favorite travel destination? Is there a place on your bucket list that you haven't visited yet? When my husband and I were discussing marriage, we agreed that travel would be a priority, and it has been. In the 15 years we’ve been together, we’ve visited all 7 continents. Our travels have been thrilling, challenging and inspiring, but my favorite destination is still my Mom’s couch. As for the bucket list: Hanoi, Vietnam. Thanks for visiting with us, Wendy! Would you like to ask our readers a question? Thank you for a wonderful interview, PJ & Andrea! I’d like to ask Romance Dish readers—What are the qualities you look for in a romance hero? PJ popping in again. In addition to the tour giveaway below, TRD is giving away a Kindle copy of Lady Vice to two people who leave a comment on today's post before 11:00 pm EST, March 18th. Hope you enjoy it, Peggy! I read it over the weekend and really liked her writing a lot. 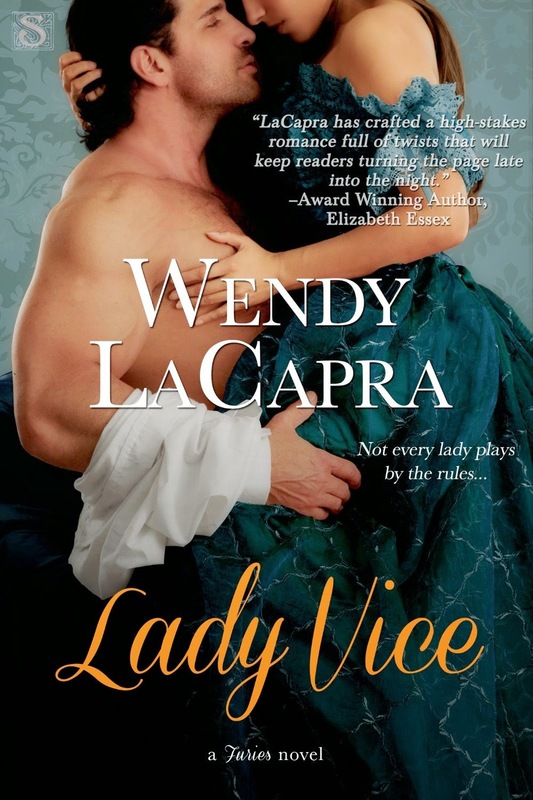 I put Lady Vice on my Amazon Wish List when I read a preview elsewhere and am looking forward to reading it. I think my favorite quality in a hero is a sense of honor or integrity. I can't resist second chances between a hero and a heroine. PJ, I'm delighted you took the time to read and crazy-thrilled by your note! And thank you Peggy & Laura for the compliments. I love second chance stories, too and agree a sense of honor & integrity definitely makes a good hero. He is loyal, honest, and kind. Kindness is important, I think. Oh yes, Cathy. Kindness & loyalty are heroic! Congratulations on the new book. Was it difficult balancing the romance and mystery? Hi Kim! In an earlier version, I had the villain's POV inserted at different places. But the Villain's POV brought down the tone and the suspense overtook the romance. I had to write those scenes to understand the nature of the crime, but I was happy to cut them out. The book sounds wonderful! Going to check it out! Wow. It looks like this book contains all my latest favorite elements! Shades of Mary Stewart, if she wrote in Georgian times. I loved Mary Stewart! Thank you, Susan. I loved Mary Stewart too! Hope you enjoy it as much as I did, Susan. Hero qualities? Just the usual: honor, integrity, kindness, intelligence - good looks don't hurt either. "a little bit rakish and a whole lot loving" yes! This. Love it, Joanna! My romance hero is one who can show kindness and compassion to everyone and animals too. In addition, a great sense of humor is a must. If we can't laugh at life and at ourselves, we're lost!